Here we have the last two projects I made for QuiltCon. Woohoo! 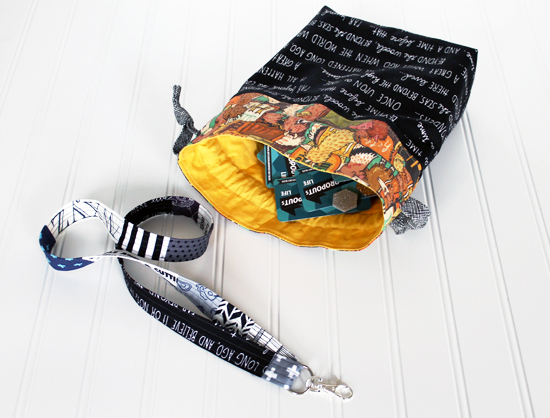 A drawstring bag and a patchwork lanyard. Both were made as part of the pin swap I’m taking part in. 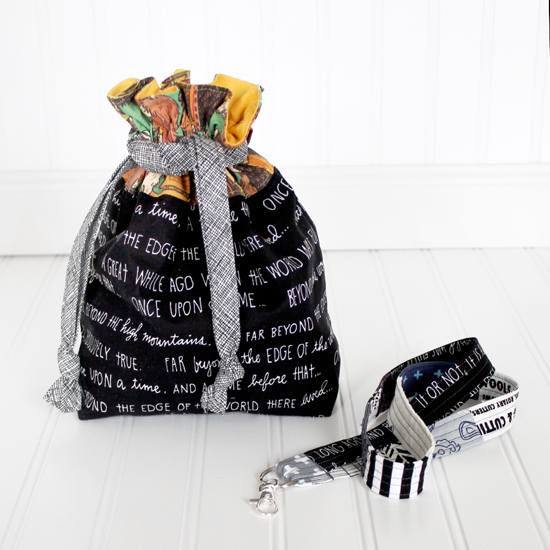 The bag was made to hold all of my Hexagon Pins and I used In Color Orders lined drawstring bag tutorial. I actually use this pattern quite often as reusable gift bags, project bags or toy bags for friends and family. They go together super fast and are beyond cute. The fabric I used is by two of my absolute favorite artist. The top Lllama fabric is by Meg Hunt and I bought it YEARS ago from her when she was having a destash sale. It can now be purchased from her Spoonflower shop. The bottom fabric is by Lisa Congdon from her line The Land that Never Was. I figured if I made it out of my favorite fabrics, I’d probably use it more later. The bag doesn’t hold all of the Hexagon pins, however it does hold enough for one day. That way I don’t give away all of my pins all at once! So this lanyard wasn’t really a necessity, since QuiltCon does provide a lanyard with your badge, but why going the boring route? I used Procrasticraft’s lanyard tutorial and a bunch of random scraps to put this together. I lengthened it by about 1″, purely because I didn’t want to cut off one of the designs. Fashion over function anyone?!? I spent maybe a total of 30 minutes putting this together and the outcome looks like it took way longer. Those are always my favorite type of projects. I have noticed I am using my Instagram account as a makeshift blog. An insta blog! I post things there that I would normally post here. It’s just easier sometimes. So I thought it would be neat to just cross post some of my favorite photos every other week! 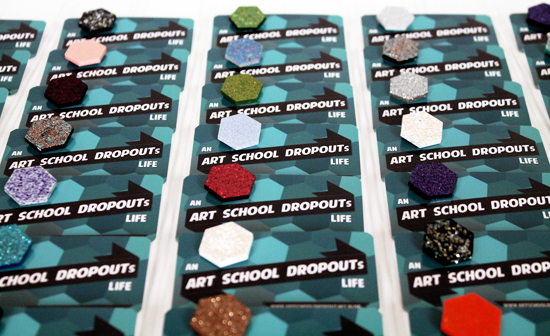 If you’re on Instagram and would like to follow me, my username is: Jessee_ArtSchoolDropout ! About a month ago the very kind folks over at Andover Fabrics sent me a sweet package filled with some precut bundles of brandnew and yet to be released fabrics for me to play with. They wanted to see what I would come up with. 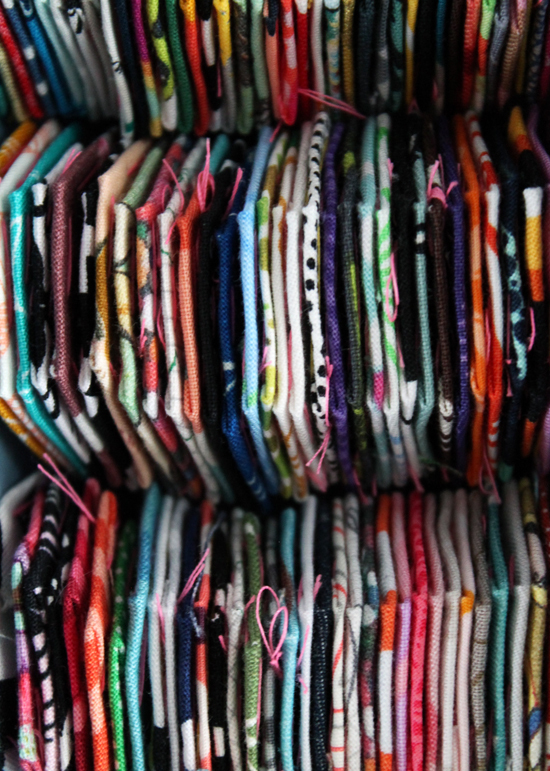 I’ve been a huge mess lately preparing for BlytheCon (2 WEEKS LEFT TO PREP) and working on my Silhouette America projects so I can focus on that BlytheCon stuff, so I haven’t been able to play with all this fabric uninterrupted. I did attempt to make a pretty, kinda chevron looking pillow out of the new 1Canoe2 line. Halfway through though I realized I had cut a bunch of pieces wrong and now I am reassembling what I can into pot holders. Luckily the line has food related items in it, which actually makes it PERFECT for potholders. Why didn’t I think of potholders before? I’ll share the finished set soon! 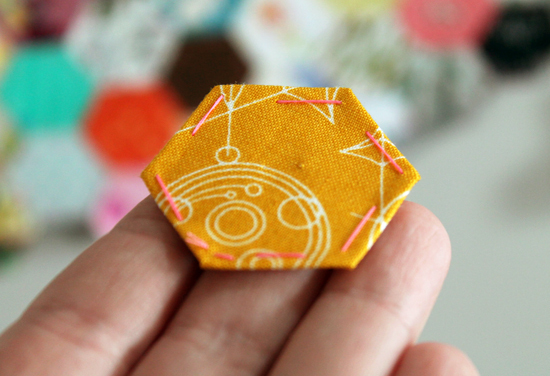 I also attacked the Chillingsworth charm packs and made a couple huge piles of hexies. They have already been pieced together and are just in the queue waiting to be quilted. (I like to do all my quilting at once. I may be a weirdo like that) Just like the potholders, I hope to share the finished piece soon. I also have BIG plans for those fat quarter bundles shown in the background of the first photo. I’m just not ready to share yet. So, on a slightly different note, this post is just a sweet reminder of the changes I’ve made in how I spend my days! I can now sit down and sew, draw, bake and more without all the stress involved with what I was previously doing. I feel like I’m actually making progress in my goals I talked about last month and I have learned so much in that time too. I’m happier and a bit less stressed (I’ll be even more stress free after BlytheCon). So I’d like to say thank you to everyone who encouraged me and has been supportive along the way.